The ALPHA Course is a spiritually ‘deadly’ so-called Bible course and with his ‘ministry’ track record it is really no surprise that Rick Warren would feel at home in such surroundings. MILLIONS of people have come to Christ through this way’ (Cecil: There’s an old saying that ‘paper refuses nothing’ and certainly the ALPHA news has clearly not refused to accept this unsubstantiated and I believe over-optimistically speculative claim). What we also find in Fresh Expressions is that the gospel is reduced to following what it and the emerging church term the “way of Jesus”. The basic proposal of following in the way of Jesus is that when we encourage others to do what Jesus did – in the form of good works, loving our neighbours, becoming involved in social action and the redemption of creation (Cecil: a ‘green agenda’) – then we lead others to become Jesus’ followers or disciples. BUT is this the biblical definition of becoming a disciple? We need to remember that, no matter how contextual the local church is to become, the gospel message is that Jesus Christ was wounded for our transgressions (Isaiah 53:5) and that the reason for Jesus coming to earth was to save people from their sins (Matthew 1:12). Also of great alarm is that, IF the gospel is spoken of, it is spoken of in terms of the life of Jesus and the great pursuit of living as he did. In other words, if a person can somehow emulate his loving ways, then that person gradually becomes a disciple by deeds rather than by repentance. There is no room within the Fresh Expressions movement for the old practice of crisis conversion. This has been clearly pushed aside for the “journey” approach… When we and specifically when Fresh Expressions (or any expression which sacrifices truth on the altar of engaging with the local context) encourage culture to shape the gospel message, then we simply re-present a rebranded liberalism to a world lost in sin and seeking true redemption’. 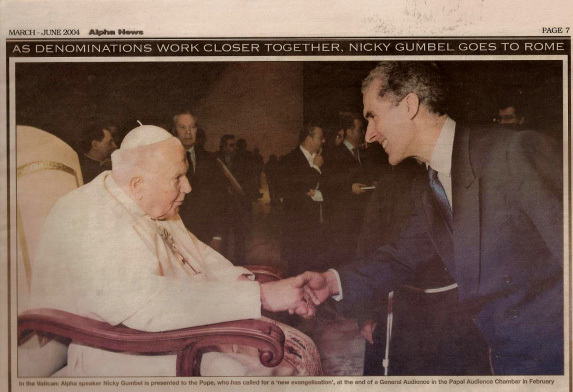 ‘After returning from Rome, Nicky Gumbel said “It was a great honour to be presented to Pope John Paul II, who has done so much to promote evangelisation around the world. We have been enormously enriched by our interaction with Catholics in many countries’. This is the same Pope who wrote in the foreword to the 1994 ‘Catechism of the Catholic Church’ – ‘I declare it to be a SURE NORM for teaching the faith’ – and of course that Catechism contains and promotes all the soul-destroying false teachings and heresies enshrined in Roman Catholicism – so much for Nicky Gumbel’s claims that the Pope was doing so much to promote ‘evangelisation’. This entry was posted in Alpha, Current Concerns, Rick Warren, Take Heed Ministries on February 14, 2014 by takeheed.